The automatic point-and-shoot systems in today’s digital cameras generally do an excellent job, but there are still many shooting situations where a little manual control can make an enormous difference. Here are some simple steps you can take to improve your pictures that will work with both simple and sophisticated cameras. When your main subject isn’t in the center of the image, the camera may decide to focus elsewhere. The fastest, easiest solution is to move the camera temporarily so your subject is in the center of the photo, press the shutter button halfway, and hold it. As long as you keep the shutter button pressed halfway, the camera will maintain focus on your subject, even if you move the camera to recompose the shot. Alternatively, you may be able to turn on face detection (if it’s a person you’re shooting) and the system will find the people in the scene anywhere on the screen. For pets and moving objects, look to see if your camera has Object Tracking AF or Subject-tracking AF. And for advanced cameras, you can always adjust the focal point manually, but this can be time-consuming and result in missed shots. Movement can cause image blur, whether it’s an athlete running down the field or your own hands shaking slightly as you press the shutter button in dim lighting. You can combat this by adjusting the camera’s ISO setting – with a higher ISO, the shutter speed can be faster, making it easier to freeze the action. There is a trade-off here when it comes to image quality, though. As you boost the ISO, the amount of noise, or visible graininess, in your photos increases. The degree to which this occurs differs from camera to camera, so a little trial and error is a good idea, but as a rule you can go to ISO 400 or even 800 with acceptable results, and often significantly higher if you’re planning to post rather than print your picture. We don’t ordinarily notice changes in the color of light – our brains make the adjustment automatically – but in fact sunlight, incandescent bulb light, fluorescent light and so on are distinctly different shades. Your camera automatically adjusts to compensate for this, but it doesn’t always succeed. The most common problems are overly reddish-orange photos in rooms lit with standard household bulbs, and greenish shots under fluorescent light. There are two approaches to tackling this problem. Nearly every camera lets you choose a white balance setting to match the environment – sunny, cloudy, tungsten (incandescent bulbs), fluorescent, etc. 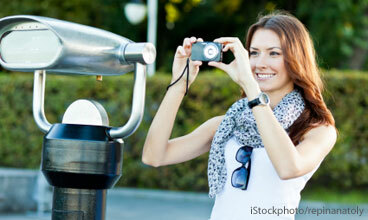 Even better is taking a manual white balance reading, if your camera allows it. This sounds fancy, but it’s actually a fast operation – you point the camera at a white piece of paper and press a button to take the setting. This provides the most accurate color reproduction possible, and you don’t have to take a new setting for each photo. Once you take a manual white balance reading, it will stay in effect until you change it. Your camera tries to ensure that everything in your photo will be reasonably well lit, using an automatic exposure system. In some instances, though, this just doesn’t work. For example, when you’re shooting at a sunny beach or in a snowy setting, the background is much brighter than the people in your photo, so they can come out far too dark. One solution is to use your camera’s preset scene settings. These vary from camera to camera, but nearly all models include settings for Beach and Snow or Backlit situations. For finer lighting control, explore your exposure compensation options. Even cameras without extensive manual controls usually provide this option. Exposure compensation lets you tweak the camera’s automatic setting to match conditions as you see them. Setting a positive exposure compensation makes the photo brighter, while a negative setting darkens the image. Try experimenting in your spare time, when you’re not trying to take mission-critical photos at important events. Often we’re so busy looking at the subject of our photos that we don’t notice what’s going on in the background. Then, when we look at the actual picture, we see a ton of distracting detail that ruins the overall effect of the image. Strategy one for dealing with this: try repositioning your subject and/or yourself to frame a cleaner shot. Does that tree branch look like it’s coming out of your child’s ear? Move three inches to the right and it’s gone. Is the busy wallpaper pattern going to distract from your daughter’s lovely smile? Ask her to move a few feet away from the wall, allowing the background to fade into the background. A more technological solution depends on your camera’s manual controls – specifically, whether it offers "aperture-priority" mode. The camera’s aperture setting determines how much light enters the camera and impacts how much of the image is in focus – what’s known as depth of field. A shallow depth of field means objects that fall within a narrower distance from the camera will be in focus, which can create a nice blurry background behind the subject of your photo. The automatic setting of most cameras, though, favors maximizing depth of field. If you can adjust the aperture manually – lower numbers equal a shallower depth of field – you can turn distracting backgrounds into fuzzy abstract patterns that make your subject in the foreground the focus of attention. Several of Sony's Cyber-shot and Alpha models, including our Editor's Pick Cyber-shot DSC-TX200V, have a Background Defocus mode, which automates the process.